Why do you have to "extend ki"? Well, you don't. You can also think of your body Med with light. But the concept of something going out of your body is easier to grasp. 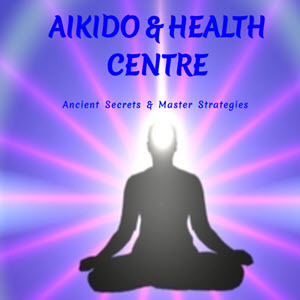 The next step, learning to align with the extension of energy from your partner and dealing with it appropriately, is the beginning of Aikido technique. 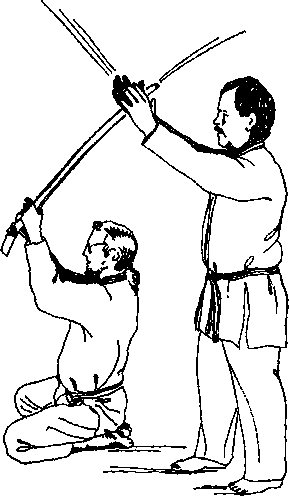 Tenkan ("turning") appears to be a physical technique, but it is based internal attitude and direction, blending and flow. It can also be done v® bally and emotionally — and must be practiced in these ways to be trul understood. I once worked in a technical reports unit responsible for turning the engineers ' reports into meaningful English. A certain engineer had a reputation of being hard to deal with, difficult, cantankerous, and sometimes downright abusive; he had even threatened to kick one arrogant young editor down the stairs if he ever touched his stuff again. There was simply no working with him, went the report, and as the New Kid on the Block, the next sacrificial lamb, I was sent down to "try to deal with him." He glared ferociously as I walked in. As this did not seem to be the time to launch into a lecture on technical style, I asked him instead to tell me about his project. And he did, with enthusiasm and passion. He made the circuits and wires and pins and the rationale behind the design fascinating. "And right now," I said, "this report does not do your work justice." "Oh," he said. "Can you please help me?" Because I meant what I said and because there was no "technique involved I didn't understand quite what had happened. Nor did I understand why this supposedly fierce and ferocious man turned 0Ut be a gracious, courtly, and delightful gentleman. Now I have a name for it. Blending, seeing things from the other person's point of view. Tenkan. 1- imgincs a water pump at One-Point with from the Cosmos, through the One-Point and o *** WhooshinS up 2. Draw lines on the opposite wall with a fin °Ut thr°Ugh the hose (arm), a Uke test fbr Uhbendable Arm. 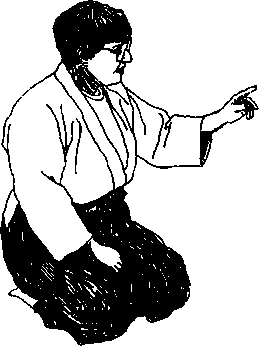 Nage rolls forward and back (koho-tento-undo). Uke test while nage is extending his mind in explaining the exercise. What you learn today, you can teach another tomorrow. If you know one thing, teach one tiling. Steven R. Covey, author of the highly successful series The of Highly Successful People, insists that it is not enough to the habits—you must teach them to another. Changing role from sW" to teacher changes you. bend it; by uke to keep it straight. Extend arm tense and tight, then relax into Unbendable Arm. Unbendable Arm in any position from straight to bent. Unbendable Arm with the fingers bent up. Once Unbendable Arm has been mastered it is easy to keep an Unbendable Arm separate from the rest of the body. In Shin-Shin Toitsu Aikido we look not only for "mind-body" coordination but also for "body-body" coordination — "Unbendable Body." 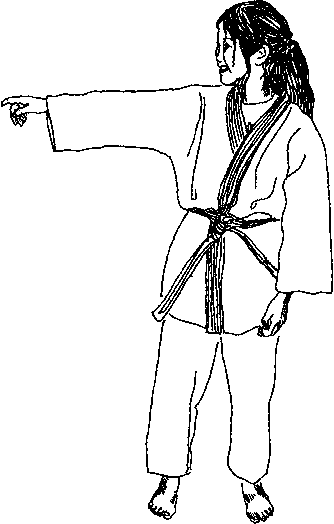 Coordination between arm and body does not necessarily exist if nage thinks only of sending a stream of Id out the arm. Uke can detect this disassociation easily: instead of trying to bend the arm, lift the arm. Nage, instead of concentrating on sending ki through the arm only, must imagined streaming out from the One-Point, an expanding bubble of ki that includes the arm — but is not limited to it. 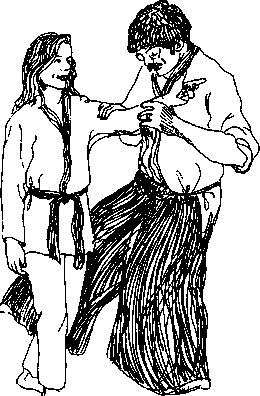 Uke, standing to the side, attempts to halt nage by pushing against the chest (not an arm across the throat, please). 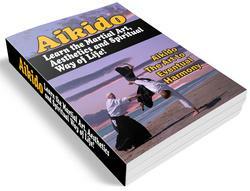 If nage extends ki — attention, purpose, and goal — out beyond uke'$ focus, uke will be unable to stop the motion. If uke has fixed attention and energy on nage's arm, no energy is left over to resist forward movement and uke is irresistibly drawn along with nage. 4. Repeat with a bearhug from behind. Always give the attacker what he wants, with a little bit more want the hand? Then give him the hand; that is his battlefield Ut have his battlefield. Now you move the earth. ^6,8« U» water from a fire hose. If you can't q»ite mZ^f ^ Jrttiag water dnp into an imaginary bucket worts too. 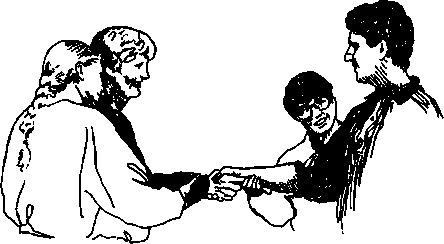 What is it that is so different between a limp handshake, a firm 0n "hand buster"? Two ukes test for Unbendable Arm. Why does unbendable arm work?